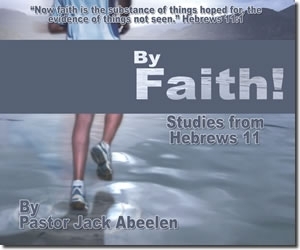 Faith lessons from Hebrews 11. Not only is faith necessary for survival, faith is also the means for doing the impossible. In this series, Pastor Jack teaches on what is known as "The Hall of Faith" by examining the lives of those great heroes of the Bible. Faith lessons from Hebrews 11. Not only is faith necessary for survival, faith is also the means for doing the impossible. In this series, Pastor Jack teaches on what is known as "The Hall of Faith" by examining the lives of those great heroes of the Bible. This album contains 16 studies.